Majlis Khudam ul Ahmadiyya NSW and Majlis Atfalul Ahmadiyya NSW held their 11th Regional Ijtema at Masjid Baitul Huda Sydney from Friday 5th to Sunday 7th August 2016. 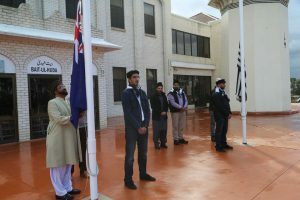 Ijtema began with flag hoisting and Dua by respected Amir & Missionary In-Charge Jamaat Ahmadiyya Australia. Formal proceedings started after Maghrib and Isha prayers where Respected Sadr Sahib Majlis Khuddamul Ahmadiyya emphasized the importance of five daily prayers. Over the course of three days, Khuddam and Atfal enjoyed the various sports and academic programs. Few special activities were introduced in this Ijtema for the first time, which all participants enjoyed a lot. Bonfire with Respected Amir sahib – A casual style get-together in which Amir Sahib and a few khuddam shared jokes and enjoyed Lovo Dinner. Special Lovo Dinner – This slow cooked festive Fijian specialty cooked underground was loved by all when served along Bonfire. Games Marquee – this special marquee was introduced to provide a place for networking among Khuddam and Atfal in free times. This marquee had: Air Hockey, Video Games, Pool Ball, Foosball, Tea and Couches in it to relax and revive – and attend the next session of Ijtema with full energy and concentration. Coffee Van – Barista made coffee was made available to make sure Khuddam do not leave Ijtema Gah even for that. Flood Lights – Due to tight schedule and for a festive environment, sports events were also held in night in flood lights. Archery – This new addition gained a lot of attraction. Respected Amir sahib and Respected Sadr sahib also attended these. Strong Man – This athletic event was for tough ones. It included multiple hurdles and activities. including weight lifting and running, which required extra physical fitness. Respected Amir sahib attended this event himself. 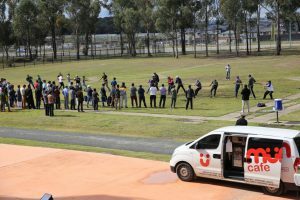 Tarbiyyat Huddles – This new style of Dars was introduced to focus sportsmen Khuddam. A team member reads a short extract of Huzur-e-Anwar (may God be his helper) Friday Sermons from last 3 months to their teams before the start of every match. First ever General Mention of Ahmadiyya Muslim Students Association (AMSA) of NSW Region also held in this Ijtema. National President AMSA-Australia Mohsin Wadood sahib and National President IAAAE (International Association of Ahmadi Architects and Engineers) Dr. Azhar Nasir sahib also attended. Dr. Azhar also gave an interesting talk on: Prophecy of Promised Messiah (AS) “Meray Fira Ke Loag…” — How can we become one such person who has been promised to achieve excellence? Members attending the Ijtema were fortunate that all three young Imams around Australia were also present at this Ijtema, namely: Respected Imam Kamran Mubashir Tahir Sahib (NSW), Respected Imam Ahmad Nadeem Sahib (QLD) and Respected Imam Syed Wadood Janud Sahib (VIC). Respected Imam Imtiaz Naveed Ahmed Sahib from South Australia was also present. Members received continuous and support throughout the Ijtema. Likewise, we were able to hold Question & Answer session and Rishta-Naata Seminar as well. All three Imams also held casual sessions with Khuddam brothers at sports events and games marquee. They were also able to share their contact details to all Khuddam in Question and Answer session and invited Khuddam to call them if they have any further questions. Judges were informed well in advance of the upcoming competitions and were all present for judging. Each competition had participants from every Majlis. The competitions were held on the Saturday morning of the Ijtema and concluded within the allotted time. A notable achievement to note is that every Majlis had 3 participants take part in the spontaneous speech competition leading to 100% participation from every Majlis. 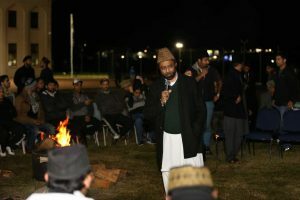 Ijtema’s concluding address was delivered by Respected Amir Sahib (National President) & Missionary In-charge Australia. Respected Amir Sahib emphasized on the theme of the ijtema, prayers. Respected Amir Sahib advised that until we build a strong connection with God, our achievements are limited. Amir Sahib also advised each member to regularly listen to Friday sermon of Huzur-e-Anwar (may God be his helper). Ijtema concluded with Dua (silent prayer) and lunch. Post Ijetma meeting was arranged to discuss overall performance of Majalis in Ijtema and to discuss Red Book points for next year Ijtemaat.